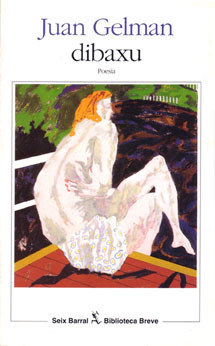 This is a bilingual Ladino-Castellano poetry collection written by acclaimed Argentine poet Juan Gelman, published in 1994. He decided to call it dibaxu, a Sephardic term that means “under”. The title already conveys the complex universe the reader may find under the veil of a seeming simplicity; a deluge of obstreperous feelings said in an undertone. The past, love, confusion, countless sensations, strong desires, empty spaces, a search for a homeland – roots with which I fail to identify, once more. In this book, Gelman’s poems first appear in Ladino and then in Spanish; I’ll follow the same order, including the English translation afterwards. Through unique and recurring imagery and a naturally distinctive cadence, he places the reader inside his mind; our mind, that inhospitable region where dreams and yearnings continue to accumulate in secrecy, longing for emotional impetus. Concise lines that belong to a bigger picture, a fragmented reality; lines that are accompanied by the use of somewhat distracting slashes, part of the author’s individual style. Gelman’s poetry reveals itself without any affectation; some things are open to interpretation but amid so much comforting frankness, they are so, so clear. He voices his thoughts with simple yet evocative metaphors and a pithy language which defies any traditional rule. His thoughts, thus, are diaphanous as fire.